Today we’re posting an article from The Aden Forecast. The stock market keeps on rolling. Once again, it’s been hitting new record highs, in the U.S. and in many other countries. And despite these impressive rises, stocks are still set to rise further. We know this may seem unrealistic, but that’s what our indicators are telling us. In other words, even though stocks are overvalued, they could keep going up and become even more overvalued. market (in red) to the big bull markets in 1974-1987 and in 1987-2000. Note that in those two previous cases, the stock market literally soared. more years, reaching levels that’re much higher than most people are expecting. In other words, more investors will start jumping in, not wanting to miss the boat. And this frenzy could end up being similar to the frenzies we saw during the dot.com bubble in the late 1990s. You may remember, at that time stocks simply soared, reaching valuation levels that were totally unprecedented. 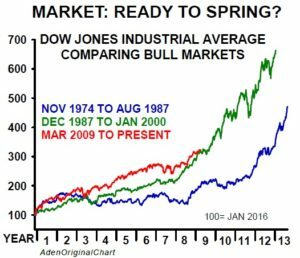 In true bull market fashion, the stock market was in a feeding frenzy for several years in the second half of the 1990s. Everyone was buying stocks like mad and that’s all anyone talked about. This is typical when bull markets reach maturity. Currently, however, this hasn’t happened yet. Yes, stocks are hitting record highs but there’s no frenzy in sight. This will probably come later. In the meantime, the world stock markets are mostly all rising and that’s another huge plus, see chart. 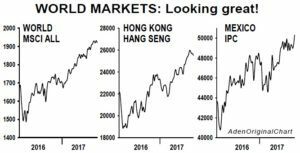 We’ve often noted this is a global bull market but it’s a super impressive one. Out of the 30 biggest stock markets, for example, 26 posted gains in the first half of this year. Plus, it was the best first half performance since the 2008 financial crisis. Also, half of those 30 markets are near record highs. This is powerful, further fueling the bullish outlook. That’s even more so because all types of markets are rising… that is, markets in developed countries, emerging markets and frontier markets; these are countries that are moving up the ladder but aren’t yet emerging. So it’s all good. For now, we continue to recommend riding this bull for as long as it lasts. Keep the stocks you have and if we see a downward correction in the weeks ahead, we’ll probably buy more stocks in some of the stronger sectors.